There are many ways of representing the sequence of colours so that they result in closed figures. One of the basic phenomena of colour perception is that our brain will order the extraordinary variety of colour impressions into a circle. This circle can commence with blue, pass through turquoise to green, and via greenish yellow to yellow to orange and then to red, and back to blue via violet and indigo. This colour-circle can be explained with reference to the three receptors in the eye and their absorption of light. Exact analysis shows that the molecules in the retina responsible for red also absorb a small amount of blue light, and this results in a continuum of perception, and thus the circle of colours. The confined geometry of colour perception first of all explains the early tendency to take Aristotle‘s very simple linear concept and change it into a ring. Once formed as a circle, the sequence of colours can be represented in two ways; as a movement around the circumference; or from inside the circle outwards. In the illustration, twelve colours have been selected, and their sequence has been associated with the classic arrangement of astronomical symbols. It is evident that this construction, too, can be read as a colour-system. In Mesopotamia, in the ancient land of Chaldea, astrology was a religion based on the deification of the stars. Later, in Greece, it was to gradually become a new form of knowledge, with its original religious-astral character being retained. It became a rational way of explaining the world, and drew on specific principles, dimensions, arithmetic and geometric theories. Astrology creates relationships between the motion of the stars and both natural and historical events. There are many religions and cultures which are influenced by its themes. During the Renaissance, these themes also played an important role in shaping Western philosophy. Later — after the arrival of modern science — astrology fell into disrepute, even if it still continues to represent one of our culture’s most easily grasped symbolic sources. Astrology relates the individual planets to the four elements (earth, fire, air and water), the signs of the zodiac, the bodily fluids, the temperaments, numerology, the rocks, the aromas and alchemic theory (which involves the ways that the human being relates to nature). 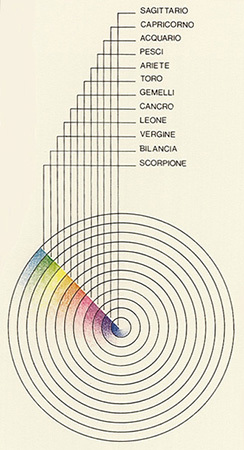 Colours, too, are part of this complex of theories. 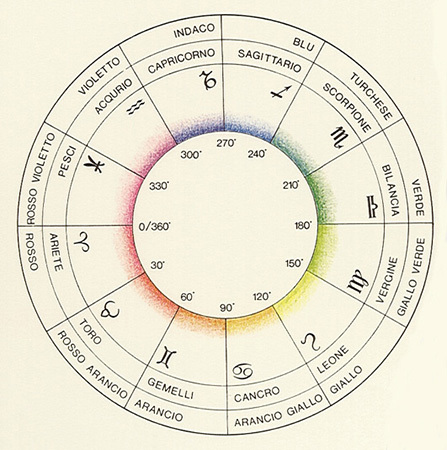 A colour has been allocated to each zodiacal sign: red to Aries, red-orange to Taurus, orange to Gemini, orange-yellow to Cancer, yellow to Leo, yellow-green to Virgo, green to Libra, turquoise to Scorpio, blue to Sagittarius, indigo to Capricorn, violet to Aquarius and red-violet to Pisces (see also the system «Archéomètre»). The same colours are shown in the second illustration, arranged in sequence along the diameter to correspond to the rainbow’s spectrum. The rainbow is an important symbolic link between heaven and earth in many cultures, with the Buddha in India descending down through the seven colours of the rainbow. The Chinese rainbow has only five colours, however, and the twelve zodiacal colours can similarly be reduced to seven (red, orange, yellow, green, indigo and violet), or to six (blue, yellow, red, orange, green and violet), or even to five (red, yellow, green, blue, violet), in line with the particular tradition of colour differentiation being observed. (Indigo, for example, can be seen as a colour-hue between blue and violet.) In the Book of Genesis, the rainbow appears after the flood as a symbolic connection between God and the Creation. In the stained-glass rose-windows of cathedrals, the rainbow is a favourite subject due to the circular, square or triangular division of the panes, drawing upon the signs of the zodiac and the colours ascribed to the planets according to the Western tradition of the Middle Ages. Both of the movement options arising from the circular form — radially outwards, and circumferentially — can be combined into a spiral, just as the German academic Athansius Kircher (1602-1680) had done in his vortex with seven orbits. It represents «the alchemic key according to the Egyptians» and is taken from his work Oedipus Aegiptiacus (1652-1654). In ancient Egypt, initiates were known as scarabs: these insects push their eggs, their offspring, in front of them. A double spiral, representing the alternating processes between solution and coagulation, expansion and contraction of the spherical vortex and the phases of «subtle energy», pictures the aspirations of the alchemists. «The spiral way of worldly spirits» leads from its source along the planetary spheres to the centre, where they find completeness. From here, they open out and brighten, view the centre from without, and then climb the other more direct spheres to regain the higher world and rediscover their divine origin. The scarab also represents prima materia, the basic substance of the seven metals which can assume any desired form or colour (gold, green, red, white, black, sky blue), and thus repeatedly experience alchemic transformation. (The planets are coloured in the illustration, although this is not so in the original.) The continuous passage of the scarab connects the colours in the same sequence as in the colour-circle, but the spiral motion places the colours at a progressively changing distance from the centre so that, when compared with the mechanical uniformity of the circular line, the model gains in complexity. The dual passage of the scarab along the seven planetary spheres into the empty and neutral centre, and from there directly to the starting point of its motion, can be interpreted from the point of view of expansion and contraction, or the slow progress of development as opposed to rapid disintegration — seductive and roaming hesitation which on the one hand recognises the diversity of the colourful temptations as represented by the planets, and on the other also knows the sudden progress — the intuition-aligned along the brightness-darkness axis. It should be noted that Kircher, more than a hundred years after the publication of Copernicus’ «De revolutionibus orbium caelestium» in 1543, remains true to Ptolemy’s geocentric diagram dating from the second century. This design has the sun followed firstly by Venus, then by the moon and finally the earth. 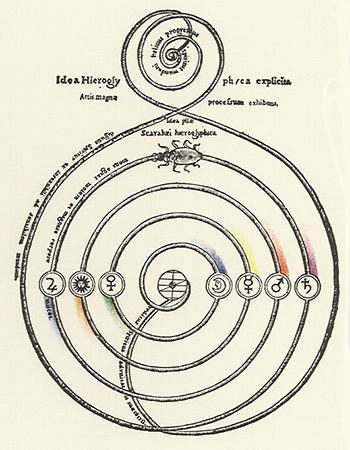 Kircher introduced his cosmological system — his «Idea Hieroglyphica explicia» — almost a decade after the formulation of his colour theory. 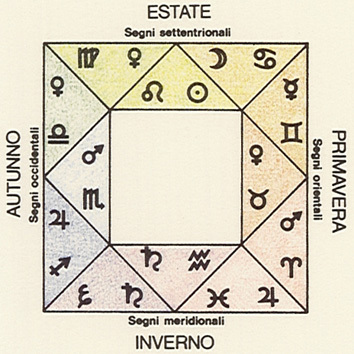 The square arrangement of planets and zodiacal signs is shown, as proposed by Jean d’Espagnet, the president of Bordeaux parliament, in 1651. D’Espagnet connects spacial and temporal elements in his diagram by assigning the classical heavenly symbols to the four seasons. Each season comprises three signs of the zodiac, and commences with a cardinal sign (Aries, Cancer, Libra and Capricorn). Three rotating, close-fitting squares become visible, which once more have the constellation of the three (triangle) plus four (square) as their theme. D’Espagnet’s portrayal is an efficient synthesis of the unchanging stability of orientated space and the continuous, cyclical sequence of time. His system is a place where colour and geometry can coexist — a connection which has persisted into the 20th century. Bibliography: J. Godwin, «Athanasius Kircher», London 1979.